CONICET investigators study the behaviour of these diving birds in the sea by means of advanced electronic instruments. 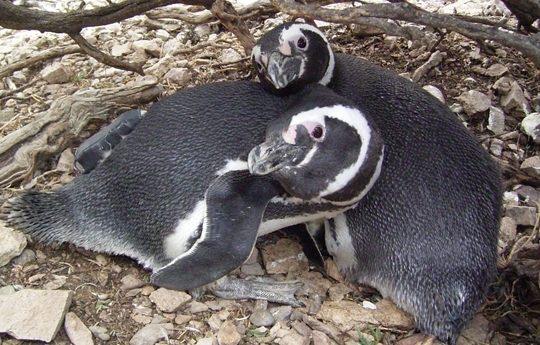 Magellanic Penguin couple. Photo: courtesy investigator. The team conducted by Flavio Quintana, senior investigator at CONICET, studies the feeding habits and behaviour of Magellanic Penguin in the sea. Thanks to an innovative measuring instrument, new information about this species was collected. In a recent investigation published in the scientific magazine PLoS ONE, the group reports the results obtained through the use of advanced electronic recorders. The scientists determined the number of captured preys and calculated captures’ rate per unit of time during penguins’ foraging trips when they are taking care of their chicks. Magellanic penguins live about 25 years; their diet consists on fish such as small anchovy, hake, sardine, silversides, squids and octopus. All these species inhabit in the Argentine sea. Each of these diving birds can capture up to 900 preys per foraging trip which lasts approximately between 24 and 40 hours, at a rate of almost 70 preys per hour under the sea. These figures are translated into an average of cumulative consumption of more than six kilos of food ingested in each foraging trip. The number of captures obtained is more striking when they are projected to the number of penguins that comprise the different breeding populations of the Argentine coast. The figures fluctuate around 200 and 300 monthly tones of fish depending on the colony. This means that more than 1.5 millions tones per year would be consumed by the total Magellanic penguins’ breeding population in Argentina. This population is estimated at 900.000 couples. This harvest would constitute approximately 87% more than the average for the period 2000-2010 of the total number of commercial captures registered annually for the main prey species of the Magellanic penguins produced in the great area of the Southwest Atlantic Ocean. Although consumption data collected are astonishing, the investigators’ recommend extreme caution at the moment of reaching some conclusions. When prey’s abundance is low, the impact of the penguins over fish stock could be minimum. “These animals have the capacity to modify their gastric clearance rate, that is to say the speed in which these birds eliminate what they ingest and, consequently, they modify their food assimilation efficiency. This mechanism would make penguins eat much when resources are abundant because they increase their gastric emptying rate and decrease its assimilation. Therefore, they eat less and assimilate more when resources are scarce”, the investigator explains. In Quintana’s point of view, this system would provide stability to marine ecosystems and it could be a process that works everyday according to the abundance of the resources. The technological development in the field of applied technology to the study of wildlife allowed obtaining miniaturized electronic recorders which are every time more and more sophisticated. These devices enable the study of movement and behaviour of these penguins when they feed in deep waters, far away from the seacoast. “Without these technological inputs, we would be unable to understand the behaviour of these and other marine predators. Besides, we would not be able to obtain valuable information such as how much they need to survive in the sea and how environment changes – like the ones provoked by man or the natural ones – could affect the biodiversity of the oceans”, the biologist affirms. These artefacts allowed the team conducted by Quintana to explore in little known aspects of diving and prey consumption. Thus, they enable us to locate the routes towards feeding areas of the Magellanic Penguin and other bird species and marine mammals of the Argentine Sea. With the use of these electronic recorders, the scientists have the possibility to study the depth of the dive of different species, their displacement speed, the body orientation, the quantity and type of food consumed and the energy expenditure resulting from their movements. This is how penguins equipped with these instruments can be used as biologic platforms to explore marine areas of difficult access or extreme depths zones and register the oceanic characteristics of the areas navigated by sea animals. Flavio Quintana. Doctoral fellow. MACN-CONICET.